When Assistant first rolled out, you had to use a voice command to bring up screen search, before a dedicated button was eventually introduced. The "What's on my screen?" 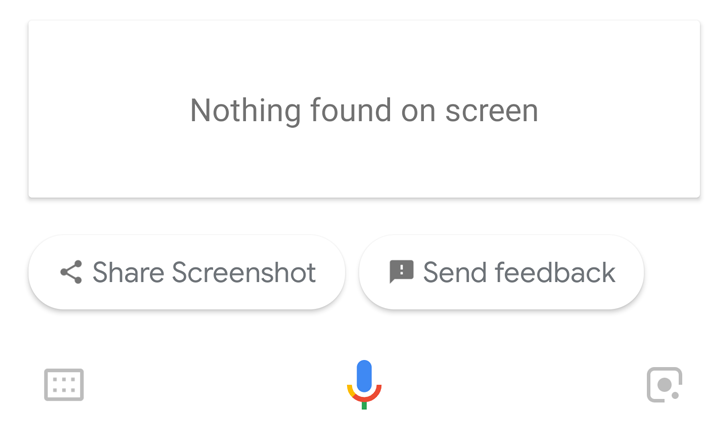 button features prominently when you call up the Assistant on your phone, but tapping it right now is leading only to the "Nothing found on screen" notice for some people (myself included), regardless of what's there. It's not clear exactly how long the problem has existed, but Reddit commenters have been talking about it for the past week. Users have tried a number of things in an attempt to restore functionality, including clearing the cache and data for the Google app, reinstalling it, or trying the beta version, but all to no avail. The feature has had a pretty bumpy ride ever since it was first introduced, but it's incredibly useful, so we hope Google gets its act together and fixes it sooner rather than later. We'll keep an eye on it in the meantime, and let us know if you notice any changes. After seeing it pointed out in the comments (Thanks, Pedro) and testing it out for myself, it seems there's an easy fix for this problem. When you call up the Assistant, if you can resist the urge to immediately press the "What's on my screen?" button and wait a few seconds first, screen search appears to work as normal. How long you need to wait is difficult to judge, but if you wait until the Assistant dots have stopped moving and turned into a microphone, that seems to be plenty long enough. This isn't ideal — the button should work straight away — but at least it seems possible to trigger it if you really need to. Like anything of this nature, it could work for some but not others, so give it a try and let us know how you get on.